Thank you for accessing our CERAVE website (the Website). Please read these terms and conditions (the Terms) before using the Website. The Website is operated by L'Oréal (UK) Limited (registered number 00271555, registered office at 255 Hammersmith Road, London W6 8AZ) or its subsidiaries ("L'Oréal"). By using the Website, you signify your acceptance of the Terms in consideration of which L'Oréal provides you with access. From time to time L'Oréal may modify the Terms. Accordingly, please continue to review the Terms whenever accessing or using the Website. If at any time you do not wish to accept the Terms, you may not use the Website. From time to time L'Oréal may run competitions and promotions via the Website. Separate terms and conditions will be posted where applicable governing such competitions and promotions. Websites or pages to which the Website is linked are for information only and have not been reviewed by L'Oréal. L'Oréal has no responsibility for the content of the websites or pages linked or linking to this website and L'Oréal accepts no responsibility or liability for any losses or penalties whatsoever that may be incurred as a result of any linking to any location on any linked websites. The Website, including (but not limited to) text, content, software, video, music, sound, graphics, photographs, illustrations, artwork, photographs, names, logos, trademarks, service marks and other material ("Content") is protected by copyrights, trade marks and/or other proprietary rights. The Content includes both content owned or controlled by L'Oréal and content owned or controlled by third parties and licensed to L'Oréal. All individual articles, reports and other elements making up the Website may be copyright works. You agree to abide by all applicable copyright laws and by all additional copyright notices or restrictions contained in the Website. You agree to pay L'Oréal, its employees, representatives and agents any and all costs, damages and expenses (including reasonable legal fees) awarded against any of them or otherwise incurred by any of them in connection with or arising from any such third party claim, suit, action or proceeding attributable to any such third party claim. Either you or L'Oréal may terminate these terms with or without cause at any time. On termination you shall destroy all Content and copies thereof, obtained from the website. 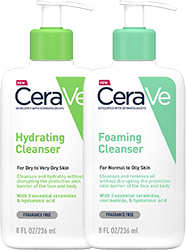 If you have any concerns or complaints about any CERAVE products and their application to you, please contact our Consumer Care Department on [email protected]. 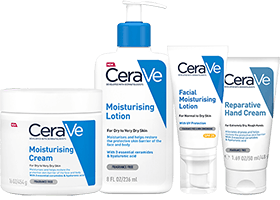 CERAVE reserves the right to refer your review to its Consumer Advisory Department rather than publishing it if it believes that your comment would be better handled in this way. The CRR Service may be unavailable from time to time for maintenance or other technical reasons and CERAVE cannot take any responsibility for any errors, omissions, interruptions, deletions or delays that may be experienced by users when accessing the CRR Service. For any comments that you post, you grant CERAVE a perpetual, irrevocable, worldwide, royalty-free, fully sub-licensable and transferable right and license to use, copy, modify, delete in its entirety, adapt, publish, translate, create derivative works from and distribute such content and/or incorporate such content into any form, medium or technology, including CERAVE'S social media pages, together with your username or first name and location. You agree to perform all further acts necessary to perfect any of the above rights granted by you to CERAVE including the execution of deeds and documents, at its request. By submitting your email address in connection with your rating and review, you agree that CERAVE and its third party service providers may use your email address to contact you about the status of your review and for other administrative purposes. You agree to indemnify, keep indemnified and hold CERAVE (which shall include its officers, directors, agents, subsidiaries, joint ventures, employees and third-party service providers), harmless from all losses, claims, demands and damages (actual and consequential) of every kind and nature, direct or indirect including reasonable legal fees, which are incurred by CERAVE for any breach of your representations and warranties set forth above. CERAVE reserves the right to suspend the CRR Service at any time without notice. If you have any concerns or complaints or want to report an issue about any CERAVE products and their application to you, or you have technical questions about the Site or an order placed on the Site please contact our Consumer Care Department on 0800 783 3975. CERAVE reserves the right to refer your query to its Consumer Care Department rather than responding via the Chat Service it if it believes that your query would be better handled in this way. CERAVE shall not be held responsible for any content created by you on the Chat Service. The Chat Service may be unavailable from time to time for maintenance or other technical reasons and CERAVE cannot take any responsibility for any errors, omissions, interruptions, deletions or delays that may be experienced by users when accessing the Chat Service. By submitting your email address in connection with your use of the Chat Service, you agree that CERAVE and its third party service providers may use your email address to contact you about the status of your query and for other administrative purposes You agree to indemnify, keep indemnified and hold CERAVE (which shall include its officers, directors, agents, subsidiaries, joint ventures, employees and third-party service providers, including but not limited to CPM United Kingdom Limited) and LivePerson Netherlands B.V., harmless from all losses, claims, demands and damages (actual and consequential) of every kind and nature, direct or indirect including reasonable legal fees, which are incurred by CERAVE for any breach of your representations and warranties set forth above. CERAVE reserves the right to suspend or cease to provide the Chat Service at any time without notice. CeraVe, a trading division of L’Oréal UK Limited, 255 Hammersmith Road, London, W6 8AZ. 20000 samples are available, subject to availability whilst stocks last.